CAN INDIA MAKE IT ? 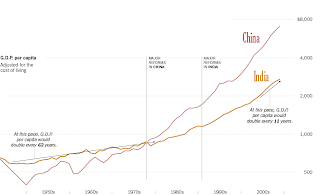 For the last few years , pundits of world economy are predicting India to be the richest country in the world (GDP) surpassing USA by 2040 and China by 2050! Twenty years back even such a thought would have given a jolt to many , but not now , although the finale is bit early to be confirmed. 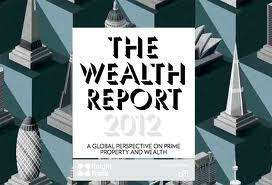 The latest in the series on the subject is WEALTH REPORT 2012 compiled by Knight Frank & Citi Private Bank which came out few weeks back . Can India make it ? I was 27 when my maiden trip abroad was made . While working for Govt of India (Kerala) I had an opportunity to have a stint in Tripoli (Libya). I took an Alitalia flight from Mumbai to Rome and then to Tripoli in 1977. Since then I have visited not less than 30 countries apart from the fact that I live in Qatar for the last 28 years where I interact with so many multi nationalities. All these years ( till probably 5 years back) wherever I travelled - West, East , Middle East ,Far East...every one - barring few who are really learned - looked at an average Indian in a perspective far from truth - poor and illiterate!! No body knew the fact that there was an acceptable percentage among Indians who were opposite to that definition , much above the world standards.Initially it was a cultural shock for me to note that .World press systematically aired news about the teeming millions of ' poor' Indians who could be a ' liability' for the rich nations ! Whatever India contributed to the world over the centuries in culture ,science, morality went hardly noticed over massive poverty in the land . Rather than remembering the fact that Indians taught the world the value of zero(0) centuries back , India was considered to be a zero by others till recently !! India got independence and made a 'tryst with destiny' in 1947 . First Prime Minister Nehru spoke on the occasion of declaration of independence on 14 August midnight in Constituent Assembly of India ...." Long years ago we made a tryst with destiny.......At the stroke of of the midnight hour ,when the world sleeps , India awakes to life and freedom........" Yes , what nobody noticed then was that it was awakening of a sleeping giant!! 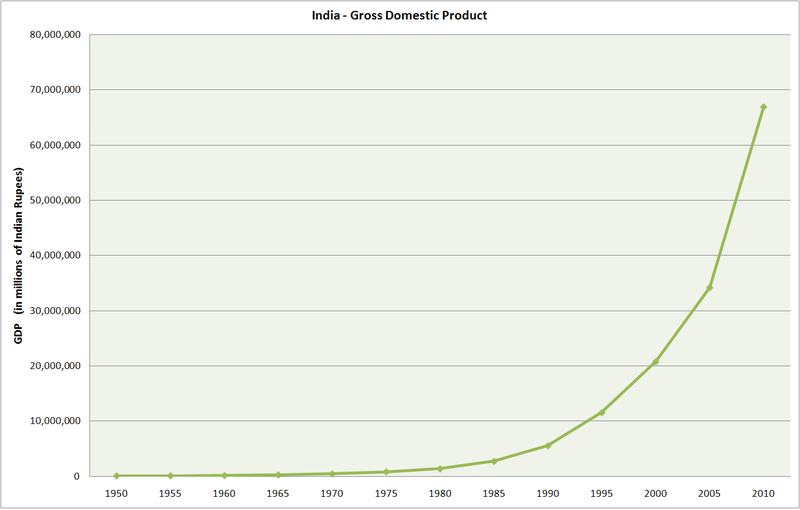 Soon after India got the freedom ,economy was inspired by the erstwhile USSR model . Five year plans , large investments in public sectors , exorbitant import duties ...days of 'licence raj'...Obviously ' rapid growth' of USSR might have influenced Indian planners and economists that time.Unfortunately India did not benefit much from practicing mixed economy. Nevertheless during this period investments were made in setting up premier educational institutions in medicine , engineering and science ,although few in number .India probably had the toughest time economically in the years followed .Waiting period for a telephone to be installed was over 10 years ! One has to book and wait for the delivery of a scooter for not less than 8 years !! Hardly few owned a car which was considered a luxury . India remained an 'underdeveloped ' country for many decades going around the wealthy world with begging bowl ! We preferred to call it 'aid'! I think it has come to our habit over the years, even now we do accept!! . Every one knows how UK reacted when India decided to go for French jets recently instead of British . In 1980s after being denied super computer manufactured by Cray Inc,USA as a result of technology embargo , India started a programme to develop an indigenous super computer . In hindsight I would remark that it was a bold decision - a mile stone for events to follow . In 1990 a prototype was produced and was exhibited at the Zurich super computer show that year which surpassed most of the existing systems then ! Eventually India produced PARAM 8000 India's first super computer. Fall of USSR could have been an eye opener for India . In 1991 was the kick off of the liberalisation policy - a U turn from what has been practicing till then . India slowly but steadily adapted free market policies and liberalised economy to international trade .Economic growth paced at a higher speed . Dividends of establishing medical, scientific and technological institutes in the country started showing the results . Private sector became strong . Growth centered in service and technology sectors was remarkable .Developed world started investing in India in money and technology . There was a jump in the size of the middle class consumer and skilled labour force. 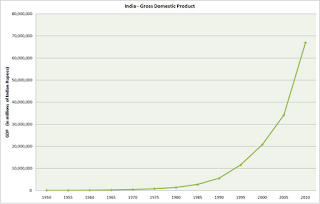 India started growing economically fast till 2010. High inflation and political paralysis has slowed down the growth in 2011.Expected growth in 2012 is 6.9% .Standard &Poor (S&P) has down graded India's economy from stable to negative few days back .They say due to weakening debt profile and sluggish investment climate but the Govt says it is not an alarming situation - only a 'wake up call' . EU crisis could also be a reason of the slow down . India is likely to pick up the speed once again. Interestingly India may be an emerging economic power house but the boom has failed to eradicate the hunger among the poor . At least so far. People in certain areas still struggle for clean potable water while bottled mineral water is abundant . Interruptions and outages in power supply still persists while generators and inverters area plenty in the market to be bought. Quality education still a dream while thousands of technical colleges are established , in spite President Obama warns the American students to learn fast otherwise Indians and Chinese students will take them over! Child malnutrition and excellent hospitals co exist. Diseases linked to affluence especially heart problems are overtaking poverty related illnesses such as tuberculosis and diarrhoea!! Even now India has a record number of people living below poverty line while one can find exclusive showrooms for worlds best limousines, watches , fashion products in every city in India . Domestic air travel volume has tremendously increased while quality of basic public infrastructure has not picked up . Corruption is wide spread in Govt. Unemployment or rather underemployment exists esp among the university educated class in spite west is apprehensive of out sourcing their jobs to India or jobs are not to be 'Bangalore'ed'! Most of the world's leading consumer brands are either already there in India or will enter soon . ( In 2008 it was in this context that President Bush made a remark that " prices of goods in the world is getting affected because the Indians and Chinese started eating". Infact his comment made was factual - sudden increases of the consumption of not only food , energy etc by China and India had an impact ...) Even simple Indian 'chai' (tea) is going to be influenced by Twining of UK soon!! While India joined the elite club of nations few weeks back test firing AGNI showing the world the capability in ICBM , there could be Indians who is in the look out how and when the next meal reaches him or her . Fancy mansions and illegal slums could be seen in the same vicinity . Indians continue to go abroad to take up menial jobs !That's the India of 2012. 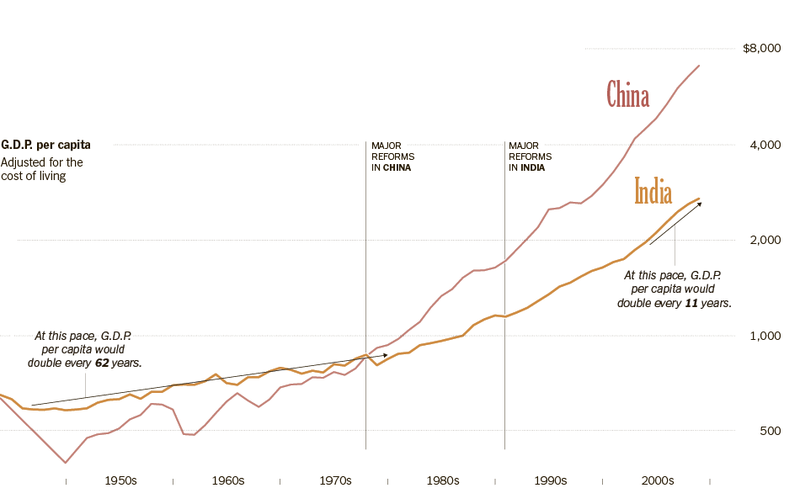 Currently India is lagging much behind China . But then how the experts of world economy predict that eventually India will take over ? Is it possible by a secularist , multi pluralistic country like India where corruption is rampant and left extremism is on the rise? One of the BRIC group but India is different to others.China has been a hare and India like a tortoise and like the legendary story goes would India make it? India is a democracy , although bit far from perfect now. Over a period of next decades it will mature more and one can expect that the Govt institutions will be more transparent and responsive . India will overtake China in population by 2030 . 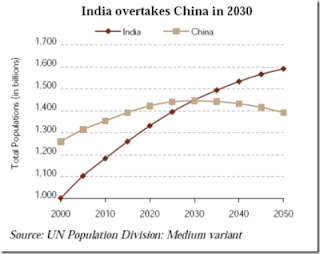 India is expected to be the country with largest young population . Type of growth of Industry in India which is more domestic centred is expected to make an impact which is different to China's type of growth . India's home grown , innovative private sector could be more result oriented in the long run . Education system expected in future in India is poised to meet the world standards. Even now it is a known fact that professional graduates from premier institutes of India can really compete with those in USA , Europe or elsewhere (not a small achievement considering the fact that we were a colonised people until six decades back)!! It could be an irony that those very rich nations are now looking forward to countries like china and India for more orders to tide over these recession days of theirs !!! India is a land of contrasts. It is a nation as of now where 'pizza- reaches-you-faster-than-ambulance' and has to move much forward to accomplish the title .But India has started the journey and against all odds it is likely to hit the target than not. But if India cannot achieve good living standards of her people consistent with the country's high levels of economic growth it has no meaning.